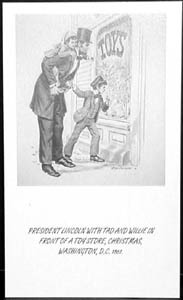 Christmas - President Lincoln with Tad and Willie in front of a toy store on Christmas in Washington, D.C. in 1867. Tad is riding piggyback on the President. "Get a good ready," by Lincoln.Abraham Lincoln is shaking hands with the crowd of supporters.Abraham Lincoln is shaking hands with the crowd of supporters.Abraham Lincoln knew the common people, their customs, folklore and feelings...and their colorful expressions. Abraham Lincoln knew the common people, their customs, folklore and feelings...and their colorful expressions. 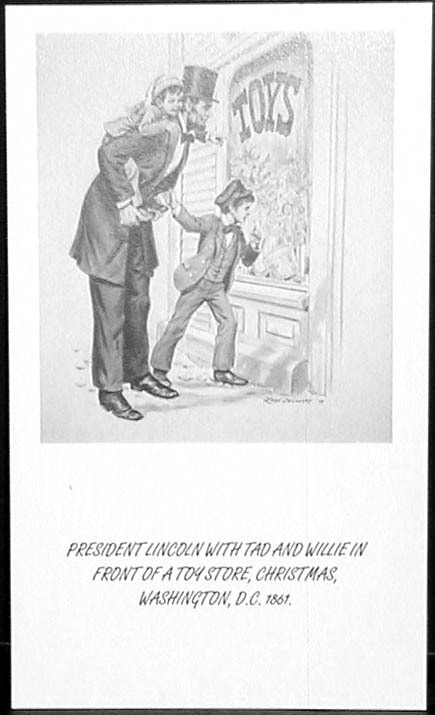 President Lincoln with Tad and Willie in front of a toy store on Christmas in Washington, D.C. in 1867. Tad is riding piggyback on the President. Copyright © 2008 Interactive Data Technologies.